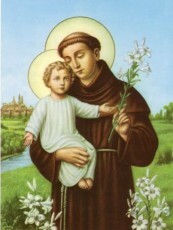 Saint Anthony of Padua is one of the most loved and admired saints in the Catholic Church today. Almost any Catholic that has lost something can hear their mom or grandmother telling them, “Ask St. Anthony to help you find it”. Saint Anthony is the patron saint of lost or misplaced things – and is often called upon to help you find it. Most people who have called on his intercession have found their lost item quickly. Anthony was born in Portugal in 1195 and at the age of 26 joined the Franciscan Order. He joined the Franciscan Order because of the five Franciscan martyrs – St. Bernard, St. Peter, St. Otho, St. Accursius, and St. Adjutus, all from his time. They were martyred in Morocco, in North Africa. St. Anthony became joined in the hope of shedding his own blood and becoming a martyr. He lived only ten years after joining the Order. He was canonized less than one year after his death. He had such a simple and resounding teaching of the Catholic Faith, so that the most innocent might understand it. Pope Pius XII made him a Doctor of the Church in 1946. Saint Anthony was called the “Hammer of the Heretics” as his great protection against their lies and deceits in the matter of Christian doctrine was to utter, simply and innocently, the Holy Name of Mary! When he found he was preaching to true Gospel of the Catholic Church to heretics who would listen to him, he then went out and preached to the fishes. This was not to convert the fishes, rather for the Glory of God, the delight of the Angels, and the easing of his own heart – overflowing with the desire to preach. He would profess the Catholic Faith with his mind and his heart at every moment in life. He is typically depicted with a book and the Infant Child Jesus, to whom He miraculously appeared. Upon exhumation, some 336 years after his death, his body was found to be corrupted, yet his tongue was totally incorrupt, so perfect were the teachings that had been formed upon it, what an example of a Doctor of the Church. St. Anthony gave us his short life as an example of how to “preach the Gospel” to everyone we see. As St. Francis said, “Use words when needed”. As we are commissioned as Catholics after every Mass we attend, to go and preach good news, we can use our lives to do that, in any occupation we are in. We can all use our thoughts, words, actions to preach the Gospel simply by loving God with all our heart, and our neighbor as ourselves. Imagine if each one of us could do this starting now, what a better place this world would be. Lets challenge ourselves to call upon St. Anthony for his assistance, especially on his feast day.